Who's Upside Down? | Terrible, Terrifying Toby | Time for Spring | The Blue Ribbon Puppies | Merry Go Round | The Frowning Prince | Will Spring Be Early? or Will Spring Be Late? "In the picture, the kangaroo saw you, standing around where you live and not doing anything very much at the moment, and, halfway around the world, there was she." You appear in both the geography book the kangaroo is reading and in the main text ofWho's Upside Down? 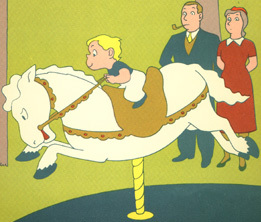 Sometimes you respond to the kanagroo and other times you notice other illustrations, but you never speak. Since "the kangaroo couldn't read, even very short words," she feels upside down and, when she feels upside down, is shown upside down. In response to this feeling, her little kangaroo steps back to take a look and tells her, "You look all right to me, ma." 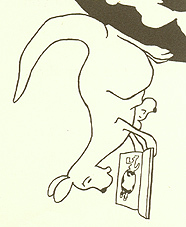 Like Ellen's lion, the little kangaroo is the practical member of the duo, suggesting that they turn the book around. Discouraged by the late snowfall, Irene decides to make "a very little snowman" because she had "very little interest left in things that had to do with winter." When he comes to life, she grows concerned that winter will never end. She reluctantly participates in his winter games and, though she doesn't wish for his demise, does wish for spring to come. Irene's snowman bears more than a passing resemblance to Mr. O'Malley in both body-shape and attitude. His ideas for winter fun are much more fun for him than for Irene (she carries the sled up the hill, then he sleds down on it). 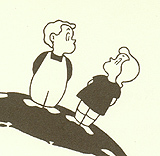 His comment that "Spring won't come, while I'm here" worries her, but when she tries to refute him, he says, "Spring, no snowman" and "Snowman, no spring." She agrees that the "first part's true," then he adds "And the last part follows." Like the sentence, the ride never ends, and the boy (referred to only as "he") turns round for as long as the reader keeps turning the pages. Accustomed to the smiling (or at least benign) faces of Crockett Johnson's child characters, it comes as a surprise to see a child looking as cross as this one. The prince seems to enjoy the power he gains by refusing to stop frowning, but -- at times -- one wonders if the frown has taken on a life of its own and if, perhaps, he really doeshave an immovable frown. "I want that frown removed from your face immediately," he said, pointing his jeweled scepter at the prince. "It is a royal command." "It is an immovable frown," said the prince. "It is not," said the king. "Is so," said the prince. The king's struggle to stop his son from frowning often seems like a battle of wills. After watching the king, we know where the prince gets his stubborn streak. The queen, on the other hand, pays little attention to the prince's frowning. Of the frown, she remarks, "It will go away," pats the prince's head, and does not respond to the prince's challenge, "How can it go away? . . . Nothing can make it go away. It's immovable." She seems to understand implicitly that to argue with the prince will only encourage him. But she patiently endures her husband's contest with his son. A very conscientious, good-natured groundhog. Before rushing off to spread the news, he pauses: "I must be certain there is no sun. I must make sure I have no shadow." When he listens and smells for the sun, a passing truck interferes with his senses and, seeing an artificial flower dropped by the truck, he thinks it real and jumps to the wrong conclusion.